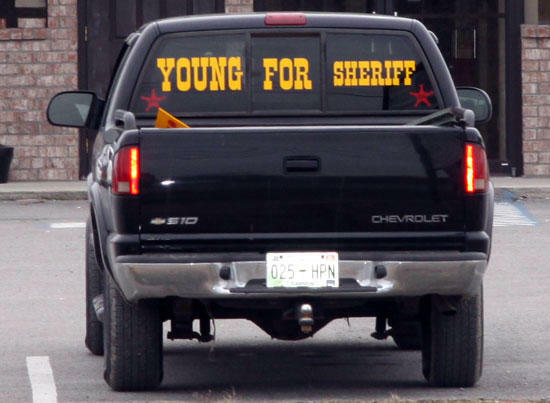 With the August 5 General Election for county offices months away, it is likely voters will be seeing plenty of signs like this one for sheriff's candidate Darrell Young on vehicles, along the roadways and on poles throughout Cannon County. Young is planning to be on the August 5 ballot for the sheriff's position along with incumbent Billy Nichols, Jack Miller and Howard Mike Grosch. Candidates for county offices have until April 1 at noon to qualify for the races. It is long over due for a good man to be Sheriff of this county. Darrell you have my vote. Come put a sign in my yard anytime. I'm from Rutherford County, lived in Cannon for years. My aunt and uncle and sister live in Woodbury, and I know they are voting for Darrell this year. I have found Darrell young to be a man for the people. I believe he will do a good job. I have had the opportunity to listen to him on issues and things that matter to the people he is wanting to do good things for the county. It is my opinion and I believe he will be an excellent sheriff for this county. He is a man of intregity and good character. I know the issues he stand on.My family will be voting for him. He is truly about change and helping to make Cannon County a better place for all people.